U.S. President Donald J. Trump’s decision to withdraw from the Iran nuclear agreement and reimpose sanctions jeopardizes the landmark arms control agreement, under which Iran dismantled much of its nuclear program and international inspectors gained extensive access to monitor its compliance. The agreement, formally known as the Joint Comprehensive Plan of Action (JCPOA), has been on the rocks since Trump’s election, and the resulting climate of uncertainty spooked many large firms from doing business in Iran, thus diminishing the economic incentives that drew Iran to the agreement in the first place. While Iranian President Hassan Rouhani and the agreement’s European signatories will now look to salvage it, it is uncertain whether they can overcome sanctions pressure from the United States. The JCPOA, which was signed in July 2015 and went into effect the following January, imposes restrictions on Iran’s civilian nuclear enrichment program. 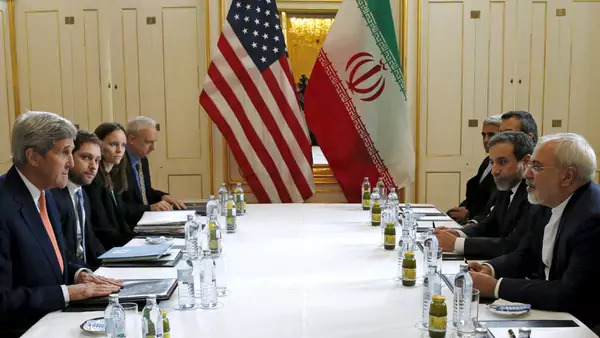 The so-called P5+1—that is, the five permanent members of the UN Security Council (China, France, Russia, the United Kingdom, and United States) and Germany—negotiated the agreement with Iran over nearly two years. During this period, the Obama administration said its intent was to set back Iran’s nuclear program so that if Iran were to sprint toward producing enough fissile material for a weapon—an indicator known as “breakout time”—it would take at least a year, up from just a few weeks. Nuclear restrictions on Iran. To extend that breakout time, the agreement requires that uranium enrichment at Fordow and Natanz be restricted and a heavy-water reactor, at Arak, have its core rendered inoperable; its plutonium byproduct, the P5+1 countries feared, could have been reprocessed into weapons-grade material. These facilities are now being repurposed for research, industrial, or medical purposes, and they are subjected to inspections by monitors from the UN nuclear watchdog, the International Atomic Energy Agency (IAEA). The accord imposes limits on the numbers and types of centrifuges Iran can operate, as well as the size of its caches of enriched uranium. (Mined uranium has less than 1 percent of the uranium-235 isotope, and centrifuges increase that isotope’s concentration. Uranium enriched to 5 percent is used in nuclear power plants, and at 20 percent it can be used in research reactors or for medical purposes. High-enriched uranium, at some 90 percent, is used in nuclear weapons.) The JCPOA also aims to guard against the possibility that Iran could develop nuclear arms in secret at undeclared sites. Sanctions relief. In exchange for these limitations on Iran’s nuclear program and opening up access to international inspectors, the European Union, United Nations, and United States all committed to lifting sanctions. While the United States has only suspended extant nuclear sanctions, it pledged in the JCPOA to remove specified entities from sanctions lists and seek legislation to repeal the suspended sanctions within eight years, as long as the IAEA concludes that Iran’s nuclear activities remain peaceful in nature. Does Iran still face sanctions? Other U.S. sanctions [PDF], some dating back to the hostage crisis in 1979, remained even after the JCPOA took effect. They cover matters such as ballistic missile production, support for U.S.-designated terrorist groups, and domestic human rights abuses. The United States has stopped enforcing its sanctions on oil exports, freeing Iran to trade on international markets again, but restrictions on financial transactions remain in place. Many banks and other companies, including foreign subsidiaries of U.S. businesses, are wary of doing business in Iran for fear of incurring fines or being barred from dealing on Wall Street, and the United States retained the right to impose new sanctions for nonnuclear matters. A major exception to the U.S. embargo allows Boeing to sell aircraft to Iranian airlines. Implementation Day, on which sanctions were lifted, came once the IAEA certified that Iran had met preliminary requirements, including taking thousands of centrifuges offline, rendering the core of the Arak heavy-water reactor inoperable, and selling excess low-enriched uranium to Russia. Since then, the IAEA’s quarterly reports have found Iran in compliance with the JCPOA’s requirements. Early on, Iran twice exceeded the amount of heavy water that it is allowed under the agreement, the IAEA reported, but these were quickly resolved. “The nuclear-related commitments undertaken by Iran under the JCPOA are being implemented,” Amano said in October 2017. The United Nations, European Union, and United States all repealed or suspended the sanctions that the JCPOA specified be lifted on Implementation Day, and since then the United States has also unfrozen or delivered to Iran certain seized funds. Most significantly, the United States stopped enforcing secondary sanctions that targeted the oil sector, which has allowed Iran to ramp up its oil exports to nearly the level it had been prior to sanctions. Those sanctions, however, appear likely to come back into force with Trump’s May 8 announcement of the United States’ withdrawal. The announcement capped the year and a half of uncertainty that had enveloped the agreement since Trump’s election. Trump regularly denounced the JCPOA during his campaign, and with each periodic waiver of sanctions he issued as president, he indicated his distaste for it. In October 2017, he took the symbolic step of “decertifying” the JCPOA, saying he judged it not in the national interest. (Periodic certification, like the sanctions waivers, is not a requirement of the JCPOA itself, but rather, one Congress imposed on the president as negotiations were in their final phase.) In January 2018 he issued an ultimatum, saying that if Congress and the United States’ European allies failed to “fix the deal’s disastrous flaws” prior to the next deadline, May 12, he would withdraw the United States from it. Trump objected that the agreement put no restrictions on Iran’s ballistic missiles program or its regional policies, as well as to aspects of the inspections regime and sunset clauses included in it. Even before the U.S. decertification, Iranian officials accused the administration of acting in bad faith, claiming that by sowing doubt over its commitment to the agreement and obstructing economic benefits to Iran, the United States was in violation of the agreement. U.S. officials have discouraged foreign governments and companies from trade with and investment in Iran, Foreign Minister Mohammad Javad Zarif charged, and the U.S. Treasury under Trump has not licensed the sale of any aircraft or spare parts to Iran. The International Monetary Fund (IMF) estimated the country’s non-oil growth in 2017 reached 4 percent. Still, Iranians have not seen as robust an economic recovery as many had expected to follow the JCPOA’s implementation. The expectation that the United States would restore nuclear sanctions discouraged trade and investment. So too did a wide range of U.S. sanctions unrelated to the nuclear program. Multinational firms fear being held liable for transacting with the numerous sanctioned entities associated with, for example, the Iranian Revolutionary Guard Corps (IRGC), which is ubiquitous in some industries. But factors unrelated to sanctions are also hampering the recovery. Corruption, mismanagement, and aging infrastructure are widely acknowledged barriers to industry, and relatively low oil prices have dampened the revenues to be made from export; oil was trading for much of 2016–2017 at around half the price it had been five years earlier. (The recent surge of oil prices has in part been attributed to the expectation of renewed sanctions.) Economic stagnation and rising inequality drove a week of widespread protests that began at the end of 2017. The JCPOA was contentious in Iran even before Trump’s election. “The Rouhani government oversold its ability to generate economic recovery following the sanctions relief,” Georgetown University’s Ariane Tabatabai said in an interview before Rouhani was reelected in May 2017, “and so now it is dialing back expectations of what is realistic.” The government has since argued that the recovery will take more time, and that its lag cannot be attributed to sanctions alone. Hard-liners in Iran argued that the United States was angling all along to keep the Iranian economy depressed and that Rouhani was hoodwinked into unfavorable terms, a view they said was bolstered by extreme rhetoric from some members of the Trump administration and Congress. They argued that Iran had “redesigned its nuclear facilities while the sanctions have only been suspended,” and so the United States could reinstate sanctions with relative ease even as the Iranian nuclear program had been permanently set back, said Mohammad Ayatollahi Tabaar, an assistant professor at Texas A&M University’s Bush School of Government and Public Service. Iran could continue to implement its JCPOA obligations as long as the agreement’s European signatories remain committed to carrying out the agreement. But with the United States’ withdrawal, there will be greater pressure in Iran for retaliatory steps, such as incrementally ramping up its nuclear program, or, in an extreme case, withdrawing from the JCPOA, or even the Nonproliferation Treaty. What will other members of the P5+1 do? The other parties to the JCPOA are firmly behind it. French President Emmanuel Macron and German Chancellor Angela Merkel vigorously lobbied President Trump to remain in the agreement during recent visits to the White House, and British Foreign Minister Boris Johnson made a similar appeal as the May deadline approached. France, Germany, and the United Kingdom were all open to addressing the Trump administration’s concerns in a side agreement, but talks broke down over reinstating sanctions once certain restrictions expire; the European parties argued such a move would violate the agreement. To preserve the JCPOA, the EU could seek to insulate European firms from U.S. secondary sanctions and facilitate oil trade with Iran. Yet the JCPOA could still erode if European measures to preserve it are not sufficient for trade and investment to continue, much less increase, or it could collapse much sooner. As long as the United States is viewed as unilaterally abrogating the JCPOA while Iran remains compliant, experts do not expect the United States’ negotiating partners to follow suit and resurrect the global sanctions regime that drove Iran to the negotiating table in the first place.